At the dawn of the great SUV age, just after the original Ford Explorer crawled out of the petroleum ooze and began to rule the roads, Land Rover brought its Discovery stateside. It was perfectly suited to American tastes, packing a V8 engine and safari-ready styling, allowing it to telegraph sophistication while navigating the asphalt jungle. It was basically a Range Rover under the skin, with updated looks and a lower price point without sacrificing much off-road capability. For the next 23 years, the Discovery evolved into softer and softer forms, leading to the BMW-ified Discovery II, the LR3, and then the LR4 that directly preceded the 2017 Discovery. By trading off-road pretense for on-road civility, the LR4 sold better than ever. But rather than softening the LR4 up any more, Land Rover hit the reset button. The 2017 Discovery starts over with its original name but a new philosophy: beginning with a solid foundation of on-road competency and adding back enough off-road capability to pass the laugh test. At least, that’s the billing. To find out how it all works in the real world, I went to southern Utah in the middle of winter. Rain-shrouded mesas and snowy ponderosa pine forests were the backdrop for a broad survey of light off-roading tasks, like scrambling up solid but gently sloping rock faces and blasting through wet sand dunes. Perhaps more importantly, I did long highway stretches through vast open spaces of the Southwest. It feels like a better road machine than its predecessors, partly because Land Rover’s astutely perceived the ascendancy of the crossover and built a vehicle for that reality. Onboard WiFi is in, the Camel Trophy is out. Speaking of structure, the 2017 Discovery doesn’t have much in common with the smaller, Evoque-based Discovery Sport. The signature unibody-plus-frame construction of Discoveries past is gone, so the unibody 2017 Discovery is up to 1,000 pounds lighter than its immediate predecessor – a reflection of the reality that older Discoveries lugged around heavy equipment that buyers simply didn’t use. It’s also 5.5 inches longer than the LR4, with a 1.5-inch-longer wheelbase, and it’s marginally lower overall. 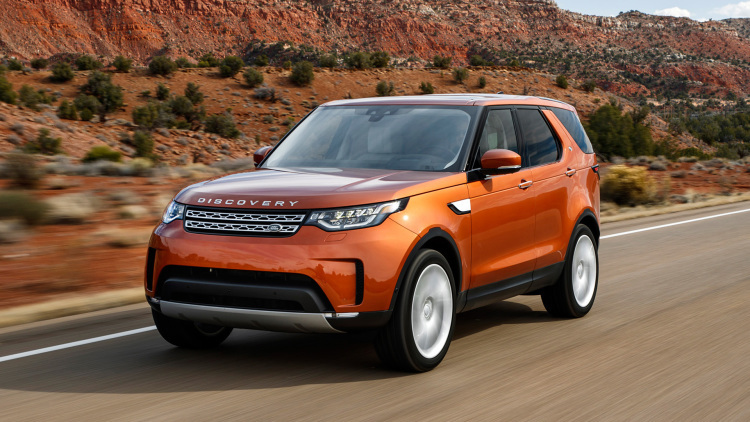 In a parallel with the original, the new Discovery’s aluminum-heavy structure is shared with the full-size Range Rover and the Range Rover Sport. It’s stiff as a British upper lip and won’t talk about its feelings. For those mourning the loss of the original’s go-anywhere spirit – you few, you happy few, a band of off-roaders – there’s a new Defender coming down the pike. It’ll land in America, and it’ll be as capable as the recently departed one, although that’s about as much as we know right now. For everyone else, think of the new Discovery in these terms: The company expects a full 90 percent of 2017 Discovery buyers will be new to the brand, and they’ll encounter a handsome SUV that’s better on-road than even the softened LR4. Soft, with better on-road manners – I realize it’s a bit practical to admire the new Discovery for what makes it more marketable. There’s an ingrained charisma to this SUV, a general Land Rover warmness. The leather is buttery, the steering wheel is meaty and the steering feel direct, the ride is crisp, and sightlines characteristically are excellent. It’s no chore to amble up a crooked pass, to roll up its pants and wade through the mud – and presumably effortless to crowd half of a soccer team inside and cross the ‘burbs to the field. So it makes sense to start over. Land Rover has combined what works, left off what isn’t necessary, and kept it lighter without becoming lesser – an interstate express for the whole family with European sophistication and American amenities. If that’s what you crave, the 2017 Discovery indeed fits the bill.